BAB Publishing Indonesia, 9789798926327, 198pp. The quintessential tastes of Indonesia are rich yet subtle, complex yet elegant. Each region of Indonesia is home to a distinctive cuisine, many of which trace back to the marvelous, abundant history of these islands. In this great nation, food is about creating a harmonious melange of diverse flavors, passions, beliefs, and traditions. Flavors of Indonesia is a beautifully illustrated Indonesian cookbook, culinary guide and cultural exploration that introduces readers to the specialties and characteristics of the world's largest archipelago. Celebrated chef and Indonesian TV personality William Wongso takes you on a journey through Indonesia, retracing the religious, architectural, and culinary history of Java as seen through the island's royal cuisine. You'll learn about spices and fresh ingredients as you visit local markets in Sumatra and sample the zesty dishes of Sulawesi. As elsewhere across Southeast Asia, some of Indonesia's most appetizing treats are to be found in its streets and back lanes, and Wongso shares his must-have street food and snack recipes in a special chapter. 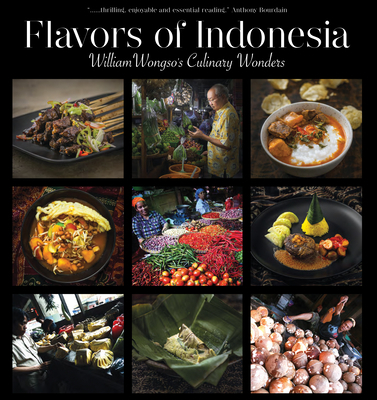 Experience the true flavors of Indonesia through William Wongso's expertly detailed descriptions of the most widely used ingredients and spices, along with recipes and techniques designed for preparation in modern kitchens. William Wongso is a household name in Indonesia, known for his culinary expertise and the popular TV show William Wongso's Culinary Adventures. His pursuit to master his country's traditional cuisines began in 1972 with the opening of a bakery in downtown Jakarta, and continues today, in his role as chef and restauranteur. Through the years, Wongso's persistent hunger for more knowledge and skills has taken him to the great culinary schools around the world, including Le Cordon Bleu in Paris and the 'Ecole des Arts Culinaires et de l'Hotellerie in Lyon. He has also held the roles of President of the Indonesian chapter of the international gastronomic society Chaine des Rotisseurs, and President of the Jakarta chapter of the International Wine and Food Society. Wongso serves as a culinary adviser to Garuda Indonesia and leads the Food Diplomacy Program endorsed by the Indonesian Ministry of Tourism and Creative Economy, Ministry of Foreign Affairs, and Ministry of Trade. Part of the mission of the program is to bring 30 Indonesian traditional culinary icons onto the global stage. Born to a Chinese-mainland immigrant father who was a personal photographer of Indonesian President Soekarno as well as an avid cook, Wongso was raised in Surabaya, a city with major culinary credentials, where he enjoyed a childhood steeped in the best of both worlds — that of his Chinese heritage and that of his East Javanese localized heritage. He remains a passionate traveler who loves exploring Indonesia's myriad villages as much as he enjoys seeking pleasures in the most unlikely places in the world.